Conny Andersson began his motorsports career on two wheels: he was a stalwart of the Swedish 250cc motocross championship for 12 years before climbing down from his motorcycle and turning his attention to cars. By then, he was in his thirties when he bought a Brabham to take part in the 1970 Swedish F3 championship. He certainly had the hang of it, though. In his third season Conny was crowned Swedish champion, taking 1972 honours by finishing on 77 points and beating 1971 champion Torsten Palm, who got stuck on 70 points. Conny notched up just the one win but with two second places and one his consistency proved enough to overhaul Palm's two wins. That season, the most interesting competitor of the series wasn't the champion nor his runner-up but 1984 World Rally Champion Stig Blomqvist who had taken wins in the 1971 1000 Lakes and RAC rallies. In those days, Blomqvist shared his time between a works Rally Saab and a Formula 3 Brabham. Stig took two third places and impressed onlookers. Much later, Stig took the 1990 Swedish Touring Car Championship in a Ford Sierra RS Cosworth. But hey, we were dealing with Conny Andersson here, so let's get back on the subject. We had left the main man of our story when he scored his first F3 title triumph, which wasn't to be his last. In fact, Conny was to continue in F3 for most of the decade, competing in both the Swedish and European F3 series. By now a Formula 3 veteran, he took his second Swedish F3 crown in 1974. After doing particularly well in the 1975 Euro series, finishing second overall, Conny was given his first taste of a Formula 1 car when he tested a Surtees at Goodwood in February 1976. These were his initial impressions: "It was much easier to drive than my F3 car. In an F1 car you can balance the car with the throttle in a much different way than you can in a F3 car." He wasn't what you could call a promising young driver - at the age of 36! - but after much wheeling-and-dealing he was able to secure a drive at Surtees. Driving one of Big John's "rental" TS19s Andersson made his GP debut at Zandvoort a few months after his first test. For a driver whose only previous experience was at F3 level, he showed quite well by safely putting his car onto the grid ahead of Pesenti-Rossi's Tyrrell. Unfortunately his race lasted for just 9 laps when his tired DFV expired. Meanwhile, he once again finished his European F3 season in second place overall. To BRM's disgrace, the Monaco organizers did not accept the team's entry and they were thrown out of the race. At Zolder both V12 engines eventually broke but Conny was actually only 8/10s from the making the grid, beating both local hero Bernard de Dryver and Hector Rebaque. For his home GP Conny was again plagued by engine trouble - the first engine lost oil pressure and the second engine seized. BRM flew in a third engine overnight and managed to install in time for qualifying, albeit barely. This engine eventually also suffered from oil pressure problems and Conny was unable to get on the grid. Same story again at France, where Conny had a few wry remarks: "We never had the chance to work on the chassis and try to develop the car. Every time the engine problems intervened. And it is hard for me to tell them to work on the handling when the engine is broke..." With the cars wearing sponsorship from Rotary Watches he could have done with a BRM running like clockwork. Conny saw no immediate improvement and opted to stop his payments and leave the team. Guy Edwards and Teddy Pilette tried in vain for the rest of the season. At the end of the year both BRM's and Conny Andersson's GP days were history. He wasn't forgotten by F1 statistics anoraks, though. For years, Conny kept a tiny niche in the F1 Guinness Book of Records by being the oldest modern-day Grand Prix debutant at 36 years of age. Only as recently as 1993 Conny lost that honour when 38-year-old Japanese veteran Toshio Suzuki made two starts for Larrousse. Born on 28 Dec 1939 in Alingsas, Sweden, this was Conny's first Grand Prix (as regular Brett Lunger was racing in America) and would be the only one he would start. His first impressions were that "the steering and the brakes are so good that you don't realise you are going fast - but if you make a mistake you will realise it very quickly!" He qualified 26th (and last) and retired after 9 laps with engine failure. 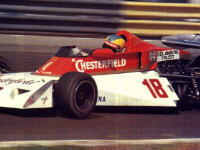 In 1977 he would appear at 4 GPs with BRM but would not qualify for any of them. And that, sadly, was Conny's Grand Prix career. Conny started racing on both 2 and 4 wheels back in the early 1960s and first came to prominence in the last year of the 1 litre Formula 3 in 1970, since when he remained one of the most highly regarded drivers in the category - he would surely have gone on to regular F2 and F1 drives had not his age been against him. He really made his mark in the first Formula 3 driver's European Cup-series in 1975. Amazingly, this was only announced in the FIA's June bulletin, when 3 of the 6 races had already been run! The opening race at Monaco was full of surprises as an unknown driver, norditalian Renzo Zorzi won the race with his GRD-Lancia. Especially his car's Repetto-tuned Lancia Beta engine started nasty rumours that were not proven right. Nastiest rumours claimed the engine to be a size of 3-litre, when the regulated maximum was 2000 cc! Further investigations were not required as the engine vanished from the top as fast it had get there. Zorzi achieved a bronze medal of the European Cup-series, but he did not gain many victories. Actually the victory should have belonged after superb driving to Conny, who was sentenced to one minute's penalty for false start. In the second race the main spot was on Conny with his March 752. He was the big star at his home track and the happenings in Monaco were already forgotten. Andersson took to the pole position also in Nrburgring with a time of 8.04.7. In 1967 this time would have given a first row position in Formula 1! Conny was ruling the competition until he had to drop out because of a mechanical problem. However another Swede, Count Freddy Kottylinsky von Kottulin won the race. Monza was at the end of June and it was also a part of English championships. That's why it gained a huge success among local teams and drivers. The fastest driver in practice was Australian Larry Perkins, who with his brother Terry drove a new Ralt RT1 car that was designed and built by famous countryman of Larry, Ron Tauranac. The top man of the English BP-series and a strong favourite to win, Gunnar Nilsson crashed his new works March 752 so badly in the qualifications, that he couldn't take part to the actual race. Luckily he made out of the accident with a small headache. Gunnar Nilsson's career stayed short as he died in cancer just as he had raised into the top elite of Formula 1. He won only one Grand Prix for Lotus. There was a tough fight during the race, Larry Perkins winning from local heroes, Spreafico and Pesenti-Rossi. At this point Conny led the F3 championships, but his gap to the holder of the second place was only few points. It was not enough. Larry Perkins last ditch effort paid off and the Australian won the European Cup Championship. Next year, Conny was undoubtedly the favorite, especially when he made a deal with the Italian representative and importer of March, Paolo Pavanello and his team. Engine came from Toyota and visited the Pedrazzani brothers tuning garage, Novamotor in Novara. Conny's partner was a young Italian, Gianfranco Brancatelli. At that point Conny himself was almost forty years old. The start of the season seemed very promising as Conny won the opening race at the long and difficult track of Nrburgring, Germany. Local Ralt RT 1 BMW driver Bertram Schäfer took the second place and the third place went to a promising young Italian, Riccardo Patrese with Trivellato's team's Chevron Toyota. From this young Italian newcomer was expected to be seen a good effort, because he had many years experience from Formula Karting-classes. The success of Riccardo was crowned with the championship gold a couple of years earlier. Conny came back to earth very soon as he was left in Zandvoort without points. At home, in the Swedish race at Mantorp, he only scored two points and Patrese moved on the European Cup-seasons top place. In the following races Conny and Patrese took turns in winning and in the second last race in Knutstorp of Skne Conny got over the disappointment in Mantorp. Victory in front of the home audience was pure gold and the enjoyment was increased by the fact that Patrese never made it to the finishing line. Conny's European championship seemed to be well in hand. Then in the final race in Vallelunga, Rome, it was Conny's turn to fail completely, failing to score any points. Conny's team mate achieved his second victory here, but even that could not save Conny's day. Patrese drove safely to the second place and it brought to the Italian the needed six European Championship points. When the seven best results out of 10 races were chosen, Conny and Patrese ended up with 52 points, but Patrese was champion because he had to drop two more points than Conny. The equality of these men was seen from the results. Both won four races. Also the second places were divided equally, but the Italian had one third place more than Conny. Patrese later had a long career in Formula 1, unlike Conny. Success in Formula 2 was also out of the limits. Conny was always left as second best in the international race circuits, although in Sweden he still won many championships. The race itself was the best of the year, and one of the best of any year. Ronnie Peterson, back at March after Lotus's dreadful 1975 season, qualified on pole in his 761, from Hunt's McLaren M23, Tom Pryce's Shadow DN8 and John Watson's Penske PC4 (fresh from his brilliant maiden GP victory in Austria). By the fifth lap, Ronnie's rush from pole had faded and John was on his tail. Ronnie began weaving luridly from verge to verge on the straight and defending the inside line into corners - so John tried going round the outside! The second time he did that he nearly lost his car on the gravel, and James slipped by into second. Clay Regazzoni, Mario Andretti, Tom, Jody Scheckter, Carlos Pace, Vittorio Brambilla and Patrick Depailler were all crowding up nose to tail behind and overtaking each other like Formula 3 drivers. It was fantastic! James and John finally weaved their way past Ronnie and went off on their own. Once again, John had the quickest car on the track, but James was defending his lead almost as savagely as Ronnie had been. Time after time, John tried the outside line round Tarzan, sliding and skidding through the dust in the middle and twice being literally forced off the road into the sand at the exit. Lunging, chopping, opposite-locking and locking wheels, the two fastest men in F1 that day fought like rabid dogs, and John's Penske set fastest lap. But then its gearbox broke, and James, his McLaren handling worse and worse, had a desparately needed respite. But not for long, for an increasingly intense dice for second place between Clay Regazzoni's Ferrari 312T2 and Mario Andretti's Lotus 77 caught him up and made it an incredible chase for first place. At the end of 75 laps, the three were covered by scarcely two seconds. But James hung onto the lead all the way and celebrated his 29th birthday with his 5th GP victory of the year , bringing him just 2 points behind Niki Lauda's tally (or so they thought at the time).